In Georgia there is a thin line between the weird unpredictable winter and blistering summer. It is hard to actually call it a season, because it does not last nearly long enough to get that title. The weather bounces back and forth across the line for a few months. This year, January had days that got up to 70 degrees; last year Atlanta (yes, pretty much the whole city) shut down for a week of ice and snow. I stayed locked up in my house eating french toast for 7 days. Two weeks ago it got down to 21 degrees; today was the mid to high 70s. I’ve decided to call it spring and hope for the best. Granted, two years ago it snowed on the 1st of April, so I can’t guarantee anything. But I figure I will go ahead and do my spring planting and other activities, because the gain I could receive in terms of harvest greatly outweighs the cost of a few seeds. 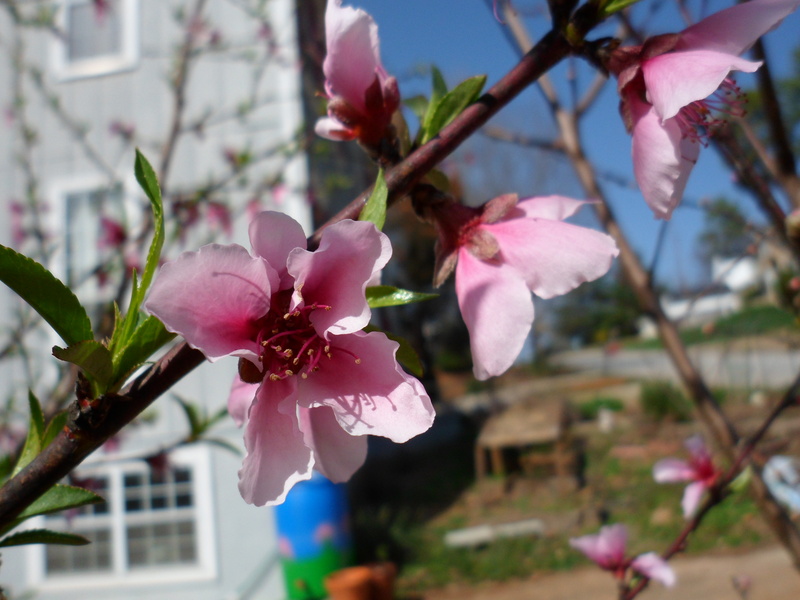 If it did frost again, the peach blossoms would die, but I have no power over that. I think I might cry if that happened; summer tastes like peaches. I did a lot of planting in the winter this year. The plan was that hardy plants could go ahead and get started under a leaf cover, and I would be saved having to try to start seeds inside. I am horrible at indoor seed starting. Almost all my inside seedlings died last year due to fungus gnats. A few of the winter plants got so big I harvested and ate them already (cabbages, chard). But most are still small. But it is a heck of a head start over where I was last year. I spent today removing leaf cover from the carrots and lettuce. You should know I already did this once. I was sure 3 weeks ago that while freezing might happen there was no chance it would drop below around 28 degrees. Lettuce and carrots would have been just fine at 28, but 21 no way! So I had a mad cat scramble to put the leaves back on. At least I got the carrots thinned out the first time. The lettuce got thinned today. I took all the small plants that were being choked out and moved them to the back of the bed. I find this method of broadcasting lots of seeds and then moving, eating, or composting the smaller plants to be much less work than starting seeds one at a time in a flat or pots. As Scrooge McDuck says, “Work smarter, not harder”. On some tasks I am really behind. I only got around to putting compost crops in one bed. And over the winter I let the weeds get really out of hand. I spent most of my day weeding, but happily it is almost all done! That which is left is only about an hour of work that I can do tomorrow. 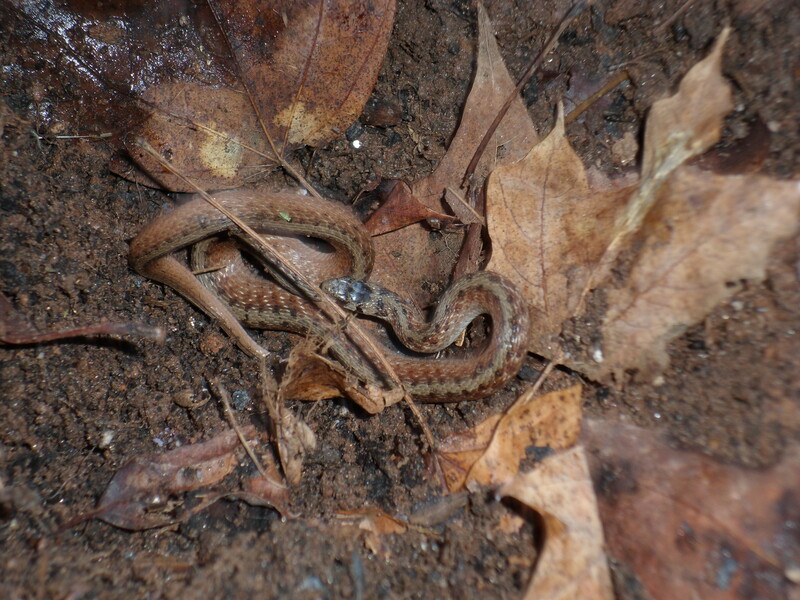 It was getting dark and we found a snake, so it was time to go inside. I got one more bed seeded with compost crops, which seems a little silly at this point. The beds should be for food right now, not rye grass and clover, but the front bed was in really bad shape, so it could use it. I am only going to let the compost crops grow a few weeks before I let the chickens attack them. I am really interested to see the chickens working in the garden. I might take them outside tomorrow if I can make a safe enclosure for them. I hope they enjoy the weeding more than I do. There is a lot of work to be done over the next few weeks; ordering seeds, planting, hopefully getting time to build a few beds in the back yard. This is the time of year that is all work and almost no harvest, aside from the never-ending salad (oh, that reminds me, I need to plant radishes tomorrow). However, I did have a nice little surprise in the front bed. 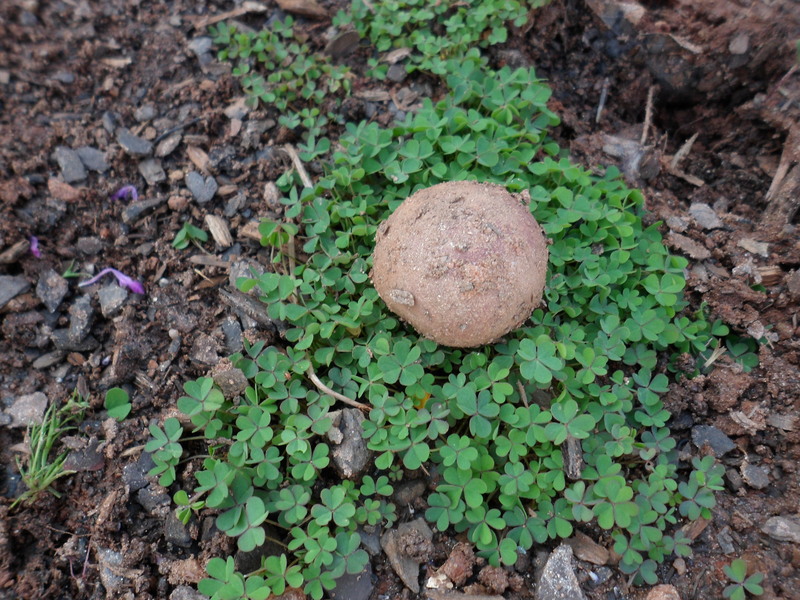 I found a wee lucky potato.